On May 14, 2013 Karen and I went to Cisco in order to attend the Silicon Valley Brand Forum. The topic was “How brand storytelling creates relevancy, engagement and action for customers”. I understood the main concepts but not all of the words. Attending such a meeting in English with professionals everywhere is always exciting. And this is a great opportunity to learn something new by listening to people. The case study presentation was given by Nancy Duarte, a communication expert and author of “Slide:ology” and “Resonate”. At the end of the presentation four panelists joined her for a discussion: Jason Baer, Lou Hoffman, and Art Kilinski. To summarize the case study, storytelling is a good visual tool in both internal and external communication. You have to structure your presentation like a story to make your ideas more interesting and memorable. People do not want to be bored. Customers have to trust your company’s services or products. So you should share a story in order to convey emotion. 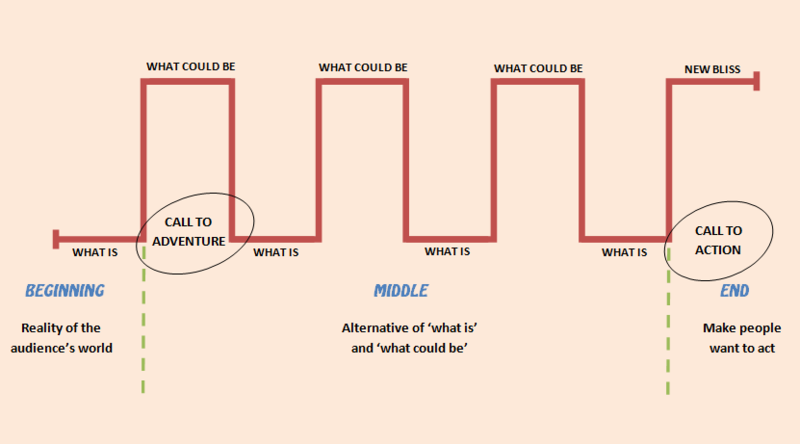 You should craft the beginning, develop the middle, and make the ending powerful by including a call to action. Nancy recommends that you pause to allow people to think. She also suggests that you go on Twitter after your speech, see what others are saying about your presentation to discover ways you can improve. 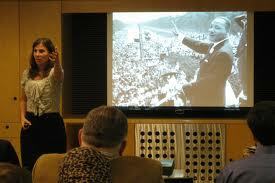 Then she analyzed Steve Jobs famous presentation of the iPhone launch and Martin Luther King’s “I have a Dream” speech. And we had a look at pauses, references, applauses of the audience, metaphors, etc. And do not forget, the audience is the hero!